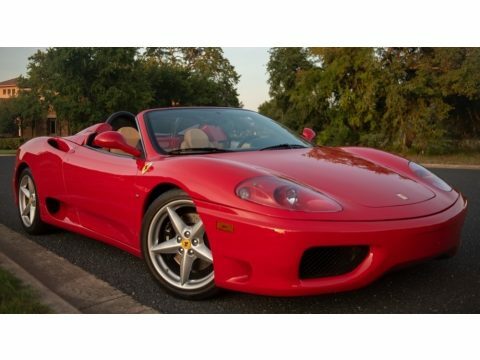 2005 Ferrari 360 Spider F1 Convertible for Sale in Georgetown, TX 78628 This is a completely sorted, original (except for the Tubi exhaust) Ferrari 360 Spyder. This Ferrari is Rossa Corsa with beige power Daytona seats, the best combination IMO. It comes with the rear challenge grill, Scuderia shields, two keys and FOBs, books, records and tools. The A/C blows cold and the paint and interior are in excellent condition. The top works great and is in excellent condition. The tires are still fresh. All fluids changed at 15,627 miles. Timing belt and gearbox service at 14,804 miles, Battery replaced at 14,623 and a tender is included. New brake pads at 14,090 miles. O2 sensor replaced in June 2018. Roller valves replaced July 2018 at 16,107 miles. Clutch life is 50%. No paintwork ever except for some touch up. No curb rash on the wheels or front bumper. This is the last year of the 360 and the lines are beautiful. The sound of the car is something else. You will love driving this car. This car needs nothing except for a new owner. You should enjoy trouble free ownership as this car has been meticulously maintained and serviced its entire life. Sale comes with All scheduled maintenance and All records. It has Always been garaged, is in Excellent condition, Looks and; drives great, a Must see, No accidents, Non-smoker, and Title in hand. Don’t let this opportunity pass! Call (402) 502-8385 for more information. ATTENTION BUYERS *Caveat Emptor* Please Remember to Inspect Vehicle Prior To Purchase!